The story of The Ramones could be giving lobotomies to moviegoers before long, as Fox Searchlight is said to be in negotiagtions to mount a biopic about the New York City punk pioneers. If greenlighted, the film will be based on the forthcoming book I Slept With Joey Ramone, a biography of the reed-thin frontman written by the singer's brother Mickey Leigh and music journalist Legs McNeil. 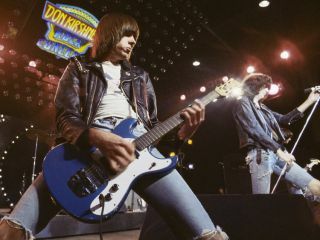 The original Ramones, who formed in Forest Hills, New York in 1974, are generally credited with putting punk on the map. Although they adopted common surnames, the four musicians - John Cummins (Johnny), Jeffrey Hyman (Joey), Thomas Erdelyi (Tommy) and Douglas Colvin (Dee Dee) - were unrelated. Their musical impact has been widespread: major acts like Pearl Jam and U2 cite them as early influences. Significantly, Johnny's guitar style - hard and fast - featured one constant: all downstrokes. A Ramones documentary, End Of The Century, was released in 2003. Here's a clip of the beginning. And who can forget The Ramones starring in their very own movie, 1979's feel-good romp Rock 'N' Roll High School? Here's a clip which shows the band dishing out five songs in record time. Be on the lookout for PJ Soles! But the big question is this: Who should play Joey Ramone? Ideas?